As a child in Sunday School I was always the thorn in the side of my teachers. The Judas problems (there were two for me) always nagged me and I could not get a straight answer from anyone. This "Gospel" does offer insight/validation about my childish concerns, if you can see through the Gnosticism.Problem 1: if, as Jesus said, everything about his life was foretold by the Prophets, including his "betrayal" and death, then Judas was only fulfilling his role in the prophesies when he kissed Jesus. At the Last Supper, Jesus excused Judas early, telling him to go and do what he must. My problem is/was: how can it be a "betrayal" when he's fulfilling the prophesies and was directly commanded by his Lord to do it? Judas believed he was acting according to Jesus' wishes. This Gospel seems to be trying to fill in the backstory for Judas.Problem 2: if Judas was indeed fulfilling the prophesies, why kill himself afterward? And how did he die? The Bible says he gutted himself and he hung himself. Which one is it? (This part always made the teachers blow spittle: caught in an obvious contradiction, some part of the Bible had to be wrong... but who can tell which part? This contradiction has quelled so many ravenous Southern Baptists asking me if I believe the Bible is the literal Word of God, therefore infallible. Regardless, I spent a lot of time in the hall at Sunday School. I remember more than one pastor expressing concern for my eternal soul because I couldn't keep my questions to myself (at which point I would ask about the child Jesus asking questions in the Temple and why was that okay and it wasn't okay for me to do the same thing; my mom had the best answer: "You're not Jesus")) Thanks to this book I now have a beginner's understanding of Gnosticism. I'm convinced that Judas neither hung himself nor gutted himself (my best guess is that he is the mysterious unnamed disciple who accompanied and cared for Mary in her old age; this book would have you believe he took time to dictate/write his Gospel. After that he is lost to time). Most of all I believe Judas was given a divine mission to help Jesus complete the prophesies - let's face it, without the crucifixion there would be no resurrection and Christianity would have been over before it started. A mortal tapped by the divine for a Holy mission would not throw away his entry into Heaven by ending his own life. Furthermore, the other disciples must have been aware of all of this. One would think they would have hunted Judas down and slaughtered him for his "betrayal" if that was what they believed. Instead we're left with a stone-faced silence in the New Testament except for the footnote that he killed himself in various ways. Was this post-publication editing or embellishment? Wouldn't that be tampering with the infallible unchangeable Word of God? So what, then, is the greater sin: tampering with the Bible/Gospel Truth or believing that Jesus knew what he was doing when he invited Judas to join the disciples - thus there was no "betrayal"? Βρήκα σήμερα στη βιβλιοθήκη του πατέρα την έκδοση του National Geographic για το Ευαγγέλιο του Ιούδα. Μαζί με το εν λόγω Ευαγγέλιο βρέθηκαν και κάποια άλλα κείμενα στην Αίγυπτο τη δεκαετία του '70 θαμμένα για περίπου 16 αιώνες. Δε μπορώ να σχολιάσω το περιεχόμενο του Ευαγγελίου καθώς είναι κάτι που γράφτηκε πριν πολλούς αιώνες και συν τοις άλλοις πρόκειται για φιλοσοφία. Άλλοι διαφωνούν, άλλοι συμφωνούν. Εγώ ανήκω στην πρώτη ομάδα διαφωνόντας γενικά με την θεολογία. Από εκεί και πέρα όμως έχει μεγάλο ενδιαφέρον η μελέτη των θρησκειών και των αποκρύφων απόψεων για αυτές. Η έκδοση πέρα από το Ευαγγέλιο έχει και άλλα τέσσερα κείμενα που αναφέρονται στην διατήρηση των χειρογραφων, την ανάλυση του περιεχομένου και τη σύνδεσή του με τους Γνωστικούς. Εγώ το βρήκα εξαιρετικά ενδιαφέρον, ειδικά ως προς την εγκυκλοπαιδική γνώση που μου προσέφερε ανεξάρτητα από την πίστη (που δεν έχω). The Gospel of Judas, by its very name, sounds dangerous and heretical. What could the arch-traitor of history teach us?Well, there isn't too much. To be fair, the text was in horrible condition when it was finally in the hands of researchers, and it took an astonishing effort to put the thing back together. There are still many gaps in the text, and a lot is speculation. But what remains is tantalizing, and makes you want more.The book, some 50 incomplete verses in 40 pages provide a brief portrait of Gnosticism. Here's how the story goes: Judas, the one of the twelve disciples, was ordered by Jesus to 'betray' and kill him. Christ tells him some of the secrets of Holy and Secret Wisdom, mainly that:1) the creator of the earth is not good, and not all-powerful.2) That all creation is imperfect and inherently leading to suffering3) Through death we might be separated from the imperfect physical bodies and move to a more perfect spiritual existenceSounds a lot like some Eastern philosophies rather than the Christianity we know. No wonder books like these were suppressed! Such teaching is anti-authority, and criticizes institutions and churches for perverting Christianity. The essays are a very useful addition and should not be passed over.An fascinating start, but more study is needed. Very interesting Gnostic text and intelligent discussion. Of course, I don't feel any of the Gnostic texts are authentic to the 1st c, most experts place them in the 2nd c. which is far too late to be an accurate narrative. The Gnostics had radical beliefs and I see this Gospel as a 2nd c propaganda piece to promote their desire to radically alter Christianity from Everyone can be saved to just the enlightened can be saved. Despite my deep skepticism about the authenticity of the Gospel, the author does an excellent job of presenting it and explaining the text in the context of the 2nd c. early Christian Church without accepting or rejecting the text. It is a fascinating read and a must for anyone interested in the early history of the church. I happen to be a fan of all of the “Banned from the Bible” specials on the History Channel, both parts I & II. I actually sit through them every time they air, you might even say I do this religiously. Although this tends to be something like a six-hour event I’m somewhat powerless to resist. I find the fact that one of the world’s most dominant religions once had several different versions to it as endlessly fascinating and is well worth re-watching again and again. I pick up on something different each time.It also makes me wonder about several “what if” scenarios. For me, it almost seems like all the best parts were taken out of the bible but I know it’s just the contrarian in me that believes this. Had all of these apocryphal texts been included in the beginning I’d surely find them to be old hat and easily ignorable. Maybe not. Who knows?Well, despite my interest in this sort of thing, I unfortunately found the reading of the actual text of this lost gospel as something of a letdown. The fragmentary nature of what could be salvaged from the severely damaged original papyrus copy pretty much ensures that just when the story is getting to the good parts all is lost. Something along the lines of this, "...and the secret to life, its meaning and everything else is _____________!” Not only did I find this frustrating but it was also sort of like watching a fairly exciting dramatic movie on satellite TV in a thunderstorm. As the dish on your roof gets battered about your reception keeps freezing and alternately skipping all over the place only to start up again sometime later leaving you really no clue as to what really is going on or what you may have missed. Well, thanks to several experts and authorities who’ve written essays that are included in this book we can get a general idea as to what this text might hold. Although I’m still glad the actual text is included here as a reference, it could largely be passed over for all it really manages to convey in its present state. In truth, it is these essays that are really what this book is about. I find all of these interesting in their own way but some more than others.The first of these essays details the saga of the initial discovery of the codex to its eventual translation several decades later. It’s an epic story and there’s a separate History Channel special devoted to this that essentially tells the same thing but it was interesting to read about it nevertheless. Another essay covers the 2nd century scholar Irenaeus and his mention of this gospel in a work he compiled in 180 AD on heresies. Overall, this essay explores this ancient scholar’s motivation and potential bias for writing about it, as well as uses the date of his book to attempt to accurately estimate when this gospel may have been written. Lastly, there is a rather scholarly exploration of other Gnostic texts, which I found interesting but did not fully enjoy as I felt it also required a greater familiarity with the subject to fully appreciate. Essentially, for me it was like an obscure and gothic written sermon read to me while I had a serious hangover. My mind kept wandering to more lighter and pleasant things like napping quietly in the shade rather than try to grasp what was being said in this. Entirely my fault I can assure you.On the whole, it is the second essay by Bart D. Ehrman that is my favorite here. This explicitly explores the interpretative meanings of the text as well as provides some general background on the Gnostic faith. Overall, I dig the Gnostics and find them to be a fascinating group. They had some rather interesting ideas. Of course, the main and most relevant one worth mentioning here being that Judas was the favorite disciple of Jesus. However, even though the reason for this perverse favoritism is given it is not completely explored to my satisfaction and I find myself having a lot more questions to ask. Rather than blame the book for not having answered these I look at this more as a primer or introduction to this subject and will most likely at some point will pick up some other books to see if I can find the answers I’m looking for there. (As it turns out, I found out after posting this review that this author has written an entire book on this subject)If anything, I was absolutely intrigued by this little book and see no reason why anyone should shy away from it based on a little thing like the stigma associated with Judas of Iscariot. He might not have been such a bad guy according to this gospel and if you think about it this wouldn't be the first time history needed to be rethought.Besides, I strongly believe everyone should entertain a critical assessment of all of their personal beliefs or what they think they know to be true. At the very least, if doing so doesn’t alter your way of thinking in any way then it allows you to find further affirmations for your beliefs, as well as in the process maybe understand other peoples just a little bit better. No matter what the outcome, I see absolutely nothing wrong in this. Around 180 Irenaeus, Bishop of what's now called Lyon, in his Adversus Haeresis, five books denouncing the errors of those deviating from his own orthodoxy, mentioned a gospel of Judas. In the late seventies such a text was found and, finally, over thirty years later, partially restored by experts and entered into the public record. The Coptic holograph itself carbon dated to about 300, but the original of which this was a copy may--or may not--be the text mentioned by Irenaeus. If so, it originated prior to 180.Like its origins, the text itself is obscure, particularly when it details its cosmology. Here one is reminded of numerous 'gnostic' texts like the Pistis Sophia--and of what Irenaeus called 'the delirious melons' of Valentinus. While this book provides, in addition to a translation of the surviving text, a commentary by Marvin Meyer which attempts to explain the various aeonic generations, I certainly didn't get it--nor, I suspect, does Meyer or anyone else.Beyond that, yes, the hype is true. In this gospel the most favored of the disciples is indeed Judas. He alone is entrusted with Jesus' explanation of the true nature of things. He alone is entrusted with the mission of securing his master's arrest and execution.What this and the myriad other gospels and apocalypses which didn't make the current canon say about the early, pre-monarchical Church is the most remarkable aspect of the whole, otherwise overblown, affair. Yes, The Gospel of Judas radically challenges 'the myth of Christian beginnings' as represented, say, by Acts or by Eusebius, but so too do the others. Let's get this straight. I finished the text, not the entire book. I'm sure the essays that followed The Gospel of Judasare interesting and provide historical insight to the lost text, it doesn't further my pursuit of reading as many religious texts as I promised - a stupid idea last year, but I bought all these books so I better damn read them. It's hard to "review" a religious text - especially one that is considered a "lost book" of the Bible. Especially hard when said "lost book" also has several lines of text missing. We also know the ending - "Judas answered them as they wished. And he received some money and handed him over to them." So what this book offers is an unique insight to the times before Judas' betrayal. It even offers a hint that Jesus already knew and warned Judas of said betrayal: "But you will exceed all of them. For you will sacrifice the man that clothes me./Already your horn has been raised,/your wrath has been kindled,/your star has shown brightly/and your heart has [...]. "It's a new look at Judas Iscariot, the betrayer, as well as, Jesus the messiah. It's also no wonder why this text will never make it into any canon. Interesting read and you should definitely pick it up. An easily readable and understandable translation and explication of a little-known noncanonical gospel. Fascinating take on some early Christians' beliefs about the most-reviled Apostle in modern Christian belief. Το National Geographic δημοσίευσε πρόσφατα το ευαγγέλιο του Ιούδα. Πρόκειται για μια προκαταρκτική έκδοση του κειμένου με εκτενή σχόλια και αναφορά στην ιστορία του.Το ευαγγέλιο του Ιούδα αποτελεί το τρίτο από τα τέσσερα κείμενα ενός παπύρου (που ονομάστηκε Codex Tchacos) 66 σελίδων, ο οποίος βρέθηκε τη δεκαετία του ΄70 στην Αίγυπτο. Ο πάπυρος είναι γραμμένος στη σαχιδική (μία από τις δύο συχνότερες διαλέκτους) της κοπτικής γλώσσας (αρχαία αιγυπτιακή). Εντυπωσιακή είναι η περιπέτεια του παπύρου μέχρι να φτάσει πριν από λίγα χρόνια στο Maecenas Foundation for Ancient Arts, το οποίο έχει αναλάβει το τιτάνιο έργο της συντήρησής του και της μελέτης του. Ο πάπυρος πέρασε από μύρια «κύματα», κλείστηκε σε θυρίδα τράπεζας, τσαλακώθηκε, σχίστηκε, καταψύχθηκε, με αποτέλεσμα όταν έφτασε στα χέρια των συντηρητών να θρυμματίζεται στο παραμικρό άγγιγμα!Ο πάπυρος υπολογίζεται ότι γράφτηκε τον 4ο αιώνα μ.Χ. και μάλλον πρόκειται για μετάφραση από το αρχικό ελληνικό κείμενο που γράφτηκε τον 2ο αιώνα μ.Χ. (και βέβαια δεν σώζεται). Ο συγγραφέας του είναι άγνωστος. Στην έκδοση του National Geographic παρατίθενται αναλυτικά τα στοιχεία που τεκμηριώνουν την αυθεντικότητα του κώδικα. Η πιθανότητα να πρόκειται για πλαστό τεχνούργημα είναι πρακτικά μηδενικές.Σε αυτή τη βάση το κειμήλιο αποκτά ανεκτίμητη επιστημονική αξία για τους μελετητές των πρωτοχριστιανικών κινημάτων. Όπως αναλύεται στο βιβλίο, το κείμενο εκφράζει τη φιλοσοφία των γνωστικών και πιο συγκεκριμένα των σηθιανών (από τον Σηθ, τον τρίτο γιο του Αδάμ και της Εύας). Οι γνωστικοί πρεσβεύουν τη γνώση, την απόλυτη Γνώση της Αλήθειας, η οποία είναι τελείως διαφορετική από αυτήν του ορθόδοξου χριστιανισμού. Μέσα από μια εξαιρετικά πολύπλοκη «κοσμογονία» οι γνωστικοί πιστεύουν ότι ο θεός των ορθόδοξων χριστιανών δεν είναι παρά μια κατώτερη θεότητα. Ο πραγματικός θεός είναι πέρα και πάνω από την αντίληψή μας και σκοπός μας είναι να φτάσουμε στον ανώτερο θεό εγκαταλείποντας το σώμα μας, το οποίο έχει φτιάξει ο κατώτερος θεός. Προσωπικά, μου έκανε εντύπωση πόσο επηρεασμένη είναι αυτή η θεώρηση από την πλατωνική φιλοσοφία (ο κόσμος των πνευμάτων και των ιδεών). Ένα άλλο σημείο άξιο αναφοράς είναι η θέση των γνωστικών ότι κάποιοι άνθρωποι έχουν αθάνατη ψυχή, η οποία θα επανέλθει στον δημιουργό της (τον ανώτερο θεό) και κάποιοι έχουν θνητή ψυχή, η οποία φθείρεται μαζί με το σωματικό θάνατο. Αυτό μού μοιάζει σαν σπέρμα ρατσισμού.Στο πλαίσιο αυτής της φιλοσοφίας, ο Ιούδας ουσιαστικά δεν είναι ο προδότης του Ιησού, αλλά αυτός που θα τον βοηθήσει να φτάσει στον αληθινό θεό. Φυσικό είναι λοιπόν το ευαγγέλιο να σταματάει σε αυτήν τη σκηνή, που αποτελεί την πράξη ύψιστης αγάπης. Τα επακόλουθα δεν ενδιαφέρουν, ούτε ο τρόπος του θανάτου του Ιησού, ούτε η ανάσταση (δεν χρειάζεται ανάσταση για να φτάσουμε στο θείο). Μέσα στο κείμενο, ο Ιησούς φαίνεται να γελάει συχνά. Ξεχωρίζει τον Ιούδα ως τον καλύτερο μαθητή του, ως αυτόν που μπορεί να τον καταλάβει καλύτερα και του αποκαλύπτει τις αλήθειες του (την πραγματική Αλήθεια).Το ευαγγέλιο του Ιούδα είναι ένα ολιγοσέλιδο κείμενο, με πολλά κενά (λόγω της καταστροφής του παπύρου), αλλά νοηματικά ακέραιο. Χαρακτηριστικά αποσπάσματα (πρόκειται για την ελληνική μετάφραση της αγγλικής μετάφρασης):Η πρώτη παράγραφος:Η απόκρυφη διήγηση της αποκάλυψης που φανέρωσε ο Ιησούς σε συνομιλία με τον Ιούδα τον Ισκαριώτη στη διάρκεια μιας εβδομάδας τρεις ημέρες προτού εορταστεί το Πάσχα.…..Ο Ιούδας [είπε] σ΄ αυτόν, «Γνωρίζω ποιος είσαι και από πού έρχεσαι. Κατάγεσαι από τον αθάνατο κόσμο του Μπάρμπελο. Και είμαι ανάξιος να προφέρω το όνομα του ενός που σε έχει στείλει».…..Γνωρίζοντας ότι ο Ιούδας συλλογιζόταν πάνω σε κάτι που ήταν πολύ ανώτερο, ο Ιησούς είπε σ΄ αυτόν, «Πήγαινε μακριά από τους άλλους και θα σου πω τα μυστήρια του βασιλείου. Είναι δυνατόν για σένα να το πλησιάσεις, αλλά θα πικραθείς πολύ. Γιατί κάποιος άλλος θα σε αντικαταστήσει, με σκοπό οι δώδεκα [μαθητές] να μπορέσουν ξανά να συμπληρωθούν με το θεό τους».…..Όταν άκουσε αυτό, ο Ιούδας του είπε, «Τι καλό είναι αυτό που έχω δεχτεί; Γιατί με ξεχώρισες για αυτή τη γενεά».Ο Ιησούς απάντησε, «Θα γίνεις ο δέκατος τρίτος, και θα αναθεματιστείς από τις άλλες γενεές και θα έρθεις να κυβερνήσεις πάνω σ΄ αυτές. Στις έσχατες ημέρες θα αναθεματίσουν την ανύψωσή σου στην αγία [γενεά]».…..Αλλά εσύ θα τους υπερβείς όλους αυτούς. Γιατί εσύ θα θυσιάσεις τον άνθρωπο που με ενδύει.Η τελευταία παράγραφος:Ο Ιούδας τούς απάντησε όπως επιθυμούσαν. Και έλαβε μερικά χρήματα και τον παρέδωσε σ΄ αυτούς. Το ευαγγέλιο του Ιούδα.Ο τίτλος τότε έμπαινε στο τέλος του κειμένου. Ενδιαφέρον είναι ότι ο τίτλος δεν είναι «το κατά Ιούδαν ευαγγέλιο», όπως τα τέσσερα αποδεκτά από την εκκλησία ευαγγέλια, αλλά «το ευαγγέλιο του Ιούδα».Γενικά, πέρα από τη φιλοσοφική, θεολογική, αρχαιολογική αξία, πέρα από τη σχέση που μπορεί να έχει με θέματα πίστης ή ιδεολογίας, πρόκειται για μια ανακάλυψη πολύ σημαντική. Judas' gospel has an unexpectedly difficult time living up to the hype. From the days of Bishop Iraenus on (close to 2,000 years now) this book has been the subject of rumors, whispers, hints and innuendo. After the centuries of buildup what a lot of folks hoped Judas' gospel would contain was an earth-shattering explosive secret that would change the very way we look at Christianity, Jesus, and the church. Instead, the gospel, which has finally materialized to counter the whispers, is a somewhat boring "Sethian Gnostic" tract, offering the usual "the Jewish God is an evil God, and the world is evil" stuff. Having seen this in other texts (both directly and in discussion) for many years there is no real revelation here. Even the reaction to this new Gospel has been somewhat dulled. The Nag Hammadi Gospels introduced us to the early Christian opposition and forced us to rethink the orthodox Christian historical narrative. With them we learned that there was a great deal of competition among a myriad of early Christian sects, each asserting the primacy and orthodoxy of its own beliefs. Judas' gospel is the work of yet another of these sects -- one not too dissimilar to those whose writings are now familiar. This gospel starts no new fires on its own, but only adds to an already existing blaze. That leaves the scholarly commentators who contribute a number of essays to this book with little to talk about. The discussion here is a bit dull as a result. With the exception of an interesting outline of the discovery of the document, very little new is said. I particularly enjoyed that the subject was presented objectively and clearly, and where necessary added enough historical context for a full exegesis of the Judas Gospel. Opposing scholarly views are expressed but generally both measured, without the media sensationalism this kind of content enjoys. As a 2nd or 3d century gospel, this book will be most appreciated by anyone looking for insights into the early Christian church. Anyone with absolute opinions about the divine inspiration of the canon, and the heresy of the Apocryphal texts may find this book educational, if not challenging as it deals mainly with the Sethian view of Christianity. The book opens with some background on the document and it's restoration, which is fascinating. The gospel itself is presented with thorough notes explaining omissions or translation issues and is followed by a number of scholarly essays which get heavier and less entertaining as you go, although most are interesting in any case. It is a small book, easily read in a day or two. A heart-braking fragment, the Gospel of Judas sheds a new light on Jesus Christ. Jesus was mirthful and didn't take his disciples too seriously. Surprise: Judas was Jesus' favorite disciple whom Jesus entrusted with bringing the crucifixion about and 'liberating his spirit from his mortal body'. The Gospel of Judas includes a somber prophecy about the other disciples, e.g. that they would invoke Jesus Christ's name and sacrifice their own children or wives, sleep with men, get involved in man slaughter, and many other 'sins and lawless deeds'. It may be that this chapter of the Gospel of Judas has a polemic agenda and was directed at the exoteric church (we are in the 2nd century) and that the other twelve disciples would corrupt Jesus' teachings and were the 'true Judas'.A few chapters deal with cosmology. These chapters suffered the most, but appear spiritually sound and contain gnostic terminology. An interesting Gnostic perspective of Jesus's teachings originally written in the Coptic language around 180 AD. Some parts of the text are missing. According to the Gnostic philosophy Jesus was sent as the Son of the "true spirit God", not of one of the lesser "earth gods". His mission was to show humanity that God resides in every human being, and that salvation lies in connecting with this God within. Through embracing the "internal God", human beings can return to an imperishable realm. I personally don't agree with Gnostic philosophy, but it was an interesting historical text to read. I would recommend it as a good read. Un texte fort, malheureusement délaissé et "maltraité" pendant des années. Après des années de recherche et de négociation, une équipe franco-américaine a pu retrouver, restaurer et traduire ce codex. Le texte est court et malheureusement incomplet, mais les passages entiers sont marquants !De très bonnes explications par les auteurs à la suite du texte, qui permettent de comprendre l'histoire du texte, le contexte, et toute son importance. The interesting part of this book is not so much the "gospel" but the glimpse into the world of the antiquities trade. 1CThe Gospel of Judas 1D is the third book about this gospel that I have read this year. The common thread in all of these books 14aside from the controversial gospel itself 14is the lore of books and publishing, especially the ephemeral world of ancient publishing. It is sad, too, to read in each book how this ancient papyrus book or codex was treated by its several late-twentieth-century owners. When it was first seen by Professor Rodolphe Kasser, the man who became its chief translator, he was alarmed to notice that the papyrus upon which the text is written crumbled at the slightest touch. Kasser pays the ultimate compliment to Florence Darbre, the professional restorer who gently and patiently conserved the ruined book: 1CWith her fairy 19s fingers, she made largely possible what, at first glance, appeared doomed to failure. 1D The recent history of this gospel is shrouded in secrecy because the discovery and subsequent sale(s) were illegal. It was found somewhere up the Nile by grave robbers and sold on the black market. After more than twenty years of miserable treatment, it was bought by the Maecenas Foundation in Basel, Switzerland, where it was rescued by Darbre, then translated by professors Kasser of Switzerland and Gregor Wurst of Germany. The Foundation also made a deal with the National Geographic Society for the publication and distribution of 1CThe Gospel of Judas. 1DThis book contains not only the nearly complete text of the short gospel, but also copious footnotes, an introduction, and four lengthy commentaries by each translator and two American scholars, Marvin Meyer and Bart Ehrman. The notes prove to be necessary because holes, tears, discolorations, and missing fragments leave sometimes enormous gaps in the text, requiring restorative guesswork to make sense of the story. Fortunately, there are a number of other gnostic texts, so that when only a few legible phrases remain of the more compromised passages of the Gospel of Judas, they sometimes turn out to be reminiscent of phrases found in the Secret Book of John, the Holy Book of the Invisible Spirit, and other gnostic works; so the translators are able to guess what some of these ravaged passages probably said. There is further justification for so much commentary. Even if the translators had had a pristine copy to work from, the Gospel of Judas, like all gnostic texts, is full of obscure allegory as well as allusions to astrology and numerology. (If you think that the canonical New Testament is free of influences such as numerology, then explain why it is that several of Jesus 19s miracles that involve fish dwell so much on the exact numbers of fish involved; for that matter, explain the far out use of allegory in Revelations 26but then again don 19t 14I don 19t want to get anyone started.) Many students of gnosticism have speculated that these texts were only really penetrable to those who were privileged to receive an oral explanation from a gnostic teacher.The second-century Bishop Irenaeus mentions the Gospel of Judas in his five-volume work Against Heresies (circa 180). Wurst believes that Irenaeus probably had heard of it but never actually saw it; nevertheless, Wurst concludes that the original of the Gospel of Judas would be over 1830 years old, if it were still to exist, but was composed after 100 14probably well afterward. It also would have been in Greek rather than the Coptic (late Egyptian) language in which the surviving third- or fourth-century copy of the Gospel of Judas is preserved. (By comparison, the only complete copy of the Gospel of Thomas is in Coptic and dates from the fourth century, but fragments from two different third-century copies in Greek also exist.) The title of the Coptic text is literally 1Cthe Gospel of Judas, 1D not 1Cthe gospel according to Judas, 1D as might be expected since the latter is the usual style of most other gospel titles 14including those of Matthew and Thomas, for example. The editors suggest that this is because this is not supposed to be a gospel about Jesus by Judas, but rather a gospel about Judas. The existence of the Gospel of Judas tells us little if anything about the situation at the dawn of Christianity. Rather, it tells us mainly about the diversity of belief among subsequent generations of early Christians. While the earliest split in Christianity was between Jewish and gentile Christians, there were multiple GENTILE Christianities by the beginning of the second century (although most varieties of Christianity were either influenced by or reacting against Jewish Christianity; paradoxically, some may actually have been doing both at once). One of these varieties was gnosticism, a system of thought influenced by Greek philosophy and mysticism, but which also appealed to some Jewish as well as Christian sects. Most scholars doubt that Jesus was a gnostic but many believe that some very early Christians might have been. Gnostic Christians were certainly ubiquitous throughout second- and third-century Christendom 14even finding their way to Rome. They did not seek to convert masses of people, instead seeking out only the few in any community who would be receptive to their message. Not only did gnostics live side by side with orthodox Christians for several centuries but, also, quasi-gnostic ideas mingled with orthodox thought 14and arguably still do. The letters of Paul and the Gospel of John, tinged as they are with Greek philosophy and mysticism, were comfortably read by gnostics with their own interpretations in mind.This gospel clearly intends to promote the beliefs of the gnostics who held that the world was created by an evil god (or the henchmen of an evil god), and that there is a higher God or 1CGodhead 1D above this lower god. This sounds polytheistic, but not more so than the belief of some 1Cmonotheists 1D in the Devil, who is, after all, an entity lower than God yet possessed of some god-like powers; indeed, the evil god or 1Cdemiurge, 1D as conceived of by the gnostics, shares some obvious characteristics with Satan who is often described as if ruling over the material world even if he did not make it.Gnostics believed that knowledge (Greek: gnosis), that is, an enlightened understanding of the true arrangement of the universe, is the beginning of a journey at the end of which one 19s soul might be reunited with the true Supreme Being in the highest spiritual realm, where the soul truly belongs. According to this theology, Jesus came not to expiate our sins through his sacrifice but to spread knowledge of the True God and then to make his own escape from this material world. There is no resurrection in the Gospel of Judas because the True God, through Jesus, has no wish to claim this world. Jesus 19s death, accomplished indirectly through Judas, is a rejection of this corrupt material plain. According to the Gospel of Judas, the title figure is not a villain but, rather, simply Jesus 19s means of escape. 1CYou will exceed all of them, 1D says the gnostic Jesus to Judas, 1Cfor you will sacrifice the man that clothes [or 1Cbears 1D] me 1D (Judas 56 14rather than being divided into chapters and verses, the Gospel of Judas is cited by page number in the codex).The gnostics who wrote and used the Gospel of Judas explicitly belonged to the Sethian sect within gnosticism (named for Seth, the third son of Adam and Eve, with whom these gnostics identified Jesus), and perhaps they belonged to a 1CCainite 1D sect or sub-sect that was suggested by Irenaeus and others to have been connected with the Gospel of Judas; however, the editors of this translation point out that no mention of Cain appears in the admittedly incomplete text of the Gospel of Judas, while Seth is quite prominent. It is possible that 1CCainites 1D was just an epithet applied to gnostics by their enemies.There is an unmistakable 14if possibly misunderstood 14elitism in gnosticism: some human beings are 1Cof the spirit 1D while others are 1Cmade of wood 1D and are seemingly hopeless cases. According to gnostics, the greater portion of humanity is trapped not only in the prison of the material world but in ignorant worship of the lower god as if he were the True God. Moreover, there looms the likelihood that not everyone who possesses the spark of the divine in his soul will achieve the illumination of divine gnosis if he does not seek it diligently. (This three-tiered hierarchy of who does and does not attain gnostic illumination lends itself to one possible interpretation of the parable of the sower [NT: Matthew 13:1-23; Mark 4:1-20; Luke 8:1-15; and, extra-canonically, Gospel of Thomas 9]. )Just as Irenaeus and other orthodox churchmen accused gnostics and their other enemies of the most heinous kinds of immorality, so the 1Cheretics 1D returned the favor. In the Gospel of Judas, the gnostic Jesus accuses his disciples 14excepting Judas 14of leading Christianity into false teachings, fornication, homosexuality, and spiritual (and possibly even physical) mass murder. Indeed, while the Gospel of Judas resolves the mystery of why a farseeing Jesus would adopt a disciple whom he knows will turn him over to his enemies, it creates the greater puzzle of why Jesus would accept the other eleven disciples even as he reproaches them for their abominations in his name. Why does he not read them out of his program entirely if he is not able to rehabilitate them before they go out to do so much evil in the future? The obvious answer is that by the time this gospel was written, Christianity had already embarked on the program decried by this gospel 19s author. (This is a good example of how this text 14like others, including the NT texts 14tell us far more about the attitudes and conflicts of the times in which it was actually written than it does about the time in which its story is set. )Much of the text is taken up with the exposition of cosmology, making the 1Cplot 1D rather thin for those who expect this gospel to be a narrative or even a novel. As far as they go, the plot points are these: Jesus finds the apostles anachronistically at Eucharist, worshipping the false lower god. After Jesus chides them, he is approached by Judas who confesses that Jesus was sent by the True God. The other apostles describe a vision they have had and Jesus interprets it to mean that they will betray his teachings. He then teaches Judas gnostic cosmology. Judas later describes a vision in which he is stoned to death by the others, and Jesus tells him that although he will be reviled by men for a long time, ultimately 1Cyour star will lead the way. 1D Toward the end of the gospel, Jesus guides Judas on a mystical ascent to the heavens. He seems to be speaking about Judas 19s relation to the 1CGreat Generation 1D that is destined for gnostic reunion in the upper reaches of heaven, but this is another compromised passage with as many as five lines completely missing. For all we know, those missing lines could involve Jesus telling Judas more explicitly than before to hand him over to the authorities. An interesting difference from the NT version of the arrest is that Jesus is evidently not grabbed in a garden but in a room in some unspecified place where he has gone to pray. Then the Gospel of Judas ends almost anticlimactically with Judas meeting with the authorities and delivering Jesus to them. This volume is very well edited, and documents well the history of The Gospel of Judas as well as the history of the one extant codex. I couldn't have hoped for a more scholarly presentation of this important historical document. I was, however, disappointed that there was no substantial discussion at any point of the authorship of the gospel. This seems to me to be a crucial lacuna in the scholarly handling of this document.As far as The Gospel of Judas itself, I went in expecting to be challenged a bit about the validity of the Christian canon. In fact, what I found was embarrassing for those (such as Bart Ehrman who has a chapter in this book) who argue against the validity of the canon based on this and other non-canonical writings. After a simple read of this gospel, it is obvious to me that Irenaeus was right: It is a heretical fabrication.I could discuss this for hours, but the thing that amazed me is that the work makes no attempt to be consistent with either Christianity or Judaism. None. It represents Gnostic theology from start to finish. It is clearly a rip off based on the popularity of Jesus Christ. Jesus Christ is not presented as Jewish or Christian, but as Gnostic. So unless someone is tempted to reject ALL of the Jewish and Christian canon, he cannot take this gospel seriously as a contender for inclusion in the canon (as Bart Ehrman would have us do).I found it fascinating to compare the preservation of this text to the preservation of the canon texts. Well worth consideration.And the book contains some very helpful commentary in the back that allows the reader to grasp the message of the gospel much more easily.Well worth the read for those who struggle with canonicity. Read with caution as at least some of the authors reject the orthodox faith. But it is a good place to learn about other contenders for canonicity without straying away from the primary sources themselves. One of the Gnostic gospels, I have to say that the reading of the actual gospel of Judas itself....is uninspiring. However, the first third of the book goes into great detail of the background of the where, when and when of this Gospel, and is quite a compelling read. Do I think that the gospel of Judas is an important find? Not really. But the background of what it is, where it was found, and what it could mean was far better than the gospel itself. Honestly, if you are into reading the Gnostic materials - this will be right up your alley. For me, it was a delightful momentary history lesson, but nothing more beyond that. The Apostle Judas Iscariot; is he a betrayer or a protector of Jesus Christ?Judas Iscariot is portrayed in the popular Christian literature as a quintessential enemy, the betrayer of Jesus who turns his master to Roman authorities. In the gospel of Luke, it is stated that Satan enters into Judas and drives him to his despicable deed, and in the gospel of John, Jesus says to his 12 disciples that one them is a devil. According to Matthew, Judas hangs himself; and according to Acts, his belly rips open and dies. During the formative period of Christian church, there were many gospels; the Gospel of Truth, and the gospels according to Thomas, Peter, Philip, James, Judas, Mary, the Ebonite's, the Nazarenes, the Hebrews, and the Egyptians that demonstrate a rich diversity of perspectives within the early Christianity. Most of these gospels were treated as heretical and they were destroyed by the early Christian church; some were lost in antiquity.The gospel of Judas is different in a number of respects from canonical gospels. In this gospel, he is not a devil but a close friend of Jesus who understood him better than any other disciples. He turned over Jesus to the authorities because Jesus wanted him to do so. Jesus wanted to escape the material world that is opposed to God and return to his heavenly home. There is no resurrection in this gospel because the entire point of salvation is to escape this material world. Jesus is regarded as a great spiritual leader, and not as a son of God. He is not considered as a savior who died for the sins of the others. The central part of this gospel is that Jesus teaches the mysteries of the universe, and as stated in other Gnostic gospels, Jesus is a teacher and a revealer of wisdom and knowledge which can eradicate ignorance and create awareness to find God. According to most Gnostics that includes gospel of Judas Iscariot, we are trapped in these bodies and we must acquire knowledge and find truth so that we can free ourselves. The mysteries Judas Iscariot learns from Jesus are steeped in Jewish Gnostic lore. In one of his meetings with his apostles, Judas Iscariot is the only disciple who had the courage to stand in front of his master and tell him that he (Jesus) is the "immortal realm of Barbelo" and Judas Iscariot is not worthy of uttering the name of the Almighty God who has sent him.Gnosticism is a mystical, esoteric religious movement that existed during the very early phase of Christianism. The discovery of 13 books containing 52 texts in the Nile River valley of Egypt in 1945 called Nag Hammadi opened the door for the history of early Christianism and the teachings of Gnostic gospels such as; the secret book of James, the gospel of Thomas, the book of Thomas, gospel of Judas Iscariot and secret book of John. Biblical scholars estimate that these books belong to second century C.E, and the followers of this abstract faith were Gnostics and they were comprised of various groups. These Christian groups maintained different systems of beliefs and doctrine, all of them insisting that their views were not only right but were of the views of Jesus and his closest followers. The gospel of Judas was preserved in Coptic but probably translated from the original Greek around the middle of second century. Irenaeus, the bishop of Lugdunum in Gaul (Lyon in present France) refer to the gospel of Judas in his work "Against Heresies," written around 180 A.C. Irenaeus is one of the well known Heresy hunters from Christian antiquity who was especially critical of Gnostic gospels. The early Christian leadership discredited and dismantled anything that contradicted their beliefs, and hence the New Testament with its four canonical gospels gives a different view of Judas Iscariot. For a long time, I had no knowledge of the books that did not make it into the Bible. So what justifies exclusion from the Bible? There were quite a few gospels written by different sects in the early days of the church, and later denounced as heresy -- "gnostic" gospels (from the Greek word "gnosis", meaning "knowledge") by Mary Magdelene, the Egyptians, Thomas, and Philip, for instance. The Gospel of Judas is one of these texts. For centuries, the only mention of it was in a treatise written in 180 A.D. by Irenaeus, the Bishop of Lyons. And then, some time around the 1970s, one copy of the Gospel of Judas was found. After many years, it fell into the hands of a group of scholars who worked to restore the document. This book was written based on their findings. There are three major parts to this book -- an introduction, the gospel itself, and commentary.The introduction is interesting. It tells a little about the gospel and the work done to restore it. However, much of the information contained within is repeated later, and largely unnecessary in an introduction.The Gospel of Judas is fascinating, even though there are quite a few bits that are missing. The authors insert placeholders like [eleven lines missing here] to let you know where there are gaps. The text that remains is frequently commented on in footnotes, which help to expand on the context of the gospel, adding information gleaned from other gnostic gospels. Jesus talks about divine cosmology (apparently a big part of gnostic teachings). Judas Iscariot, often portrayed as history's ultimate betrayer, is painted here as a hero. Jesus pulls him aside and says he's the only one who truly understands, shows him a glimpse of heaven, and then Jesus asks Judas to betray him, so that he can escape the mortal body he was trapped in. This is quite a different portrayal of Judas, one that the canonical Bible does not agree with at all. Hence, heresy.The commentary in this book is very long-winded (even longer than this review). While large portions of it are interesting, and I'm quite grateful to see the discussion presented objectively, I think it suffers greatly from having been written by four people, who obviously wrote their essays independently. There's about a hundred and twenty pages of commentary in here, and some of it repeats information already in the introduction. In the rest, the authors repeat each other, and often repeat themselves in their own essays. I firmly believe that more than half of the commentary could be deleted, with no loss in meaning at all, just by merging all these individual parts into a single, coherent essay. I can't help but feel like they were just trying to pad the book's page count to justify the $22 cost.In short, this is worth reading once, if you're curious. But don't feel bad if you'd rather skip the commentary. Most of it is summarized in the introduction anyway. There are basically two parts to this book: the English translation of the part of the much damaged Codex Tchacos that contains the Gospel of Judas, and the scholarly apparatus that attempts to place the gospel in historical and cultural context, as well as to relate the history of the codex itself. The gospel is fascinating, even considering how difficult it is to read because of the lacunae produced (evidently) by the mishandling of the codex by the individuals trying to sell it to anyone who would buy it. It is an early evocation of a Christian Sethian gnostic text probably from the second century AD in which Judas proves to be the best and most trusted of Jesus's disciples. On the one hand, this may shock some readers immersed in Christian culture, but the idea that Judas should, at the least, no be reviled (because he enabled Christ's crucifixion) has a long history in theological circles. Also, the disciples (who, in this gospel, are portrayed as being utterly clueless) are treated in ways similar to their treatment in the canonical gospels. What I found personally fascinating was the emphasis on Jesus "clothed" in a human body, and upon the relation of the stars to human fate (both of which bring to mind certain strains of HP Lovecraftian fiction, a slight obsession of mine). In any case, the gospel is obviously a very important document that can enlighten us to some things we did not previously know about early Christianity. As for the scholarship, this is mostly pretty good, particularly Meyer's essay demonstrating that the gospel must be an early document that contributed to the more fully formed Sethian gnosticism that is displayed by many of the Nag Hamadi codices. Kasser's essay, however, is pretentious and unbearable beyond belief. Perhaps this is an accepted academic style in German religious studies scholarship, but to me it reminded me of certain Nabokovian characters who aggrandize themselves at the expense of proper scholarly distance from what they are attempting to argue. This is particularly egregious when Kasser accuses James Robinson of "ethical misconduct" because Robinson, who could have bought the codex thirty years ago and thus perhaps prevented some of the subsequent damage to it, did not "properly" inform the scholarly community of its existence. This simply comes off as high-handed from a scholar who presents himself in the role of the "rescuer" of this codex from its fate. Please. Get over yourself. Christian tradition depicts Judas as the ultimate betrayer, selling out the Son of God for 30 silver coins. Orthodox Christian theology teaches that Jesus was incarnated in order to sacrifice himself for the sins of mankind. If Jesus' whole reason for existing was to die by crucifixion then how was Judas' action that of a traitor? Was it instead a holy mission? The Gospel of Judas presents of version of the relationship of Judas and Christ that reads like Christian Opposite Day.The Gospel of Judas is a very brief Coptic text believed to date from the second century. All that was know of it for centuries was that early church fathers denounced it as heretical. It was believed lost forever until a copy was discovered buried in a cavern in Egypt in the 1970's.In the text Jesus laughs at his disciples' beliefs and tells them that no one of their generation will understand who he is. Judas steps up and states that Jesus comes from the immortal realms. Jesus takes Judas aside and teaches him secrets about the nature of the cosmos. This Gnostic cosmology sounds a lot like the Neoplatonic writings of Plotinus. Emanations and self-generated aeons send forth angels and luminaries in a series of generations until a fallen Archon creates the corrupt physical world as a mockery of the spiritual world. The gospel ends with Judas rescuing Jesus from the physical world by handing him over to be executed. By ending his life trapped in a physical body he has freed Jesus to return to the blessed immortal realms of the spirit.The bulk of the book is taken up by commentaries on the short Gnostic text. Rodolphe Kasser provides a compelling account of how the document was discovered and restored. He sometimes loses his scientific detachment while describing his outrage over how the document was mishandled and almost destroyed by antiquities dealers who wanted to maximize their profits with no regard for history or science. The always controversial Bart Ehrman examines the theology of the gospel. Gregor Wurst examines the question of whether this document is the same Gospel of Judas that Irenaeus attached in Against Heresies. Finally Marvin Meyer puts the work in the larger Gnostic context by comparing it with documents from Nag Hammadi. The Gospel of Judas, intriguing, subtle, and difficult, will likely be remembered, along with the Nag Hammadi Library, as one of the greatest discoveries concerning early Christianity made during the 20th century. What is most striking about this gospel is not its claim that Jesus wanted to die, to be released from his body and return to the great kingdom he had come from, but the many similarities and overlapping references it shares with the canonical gospels. Perhaps most striking of all these resemblances is the "Who do you say that I am" episode during which Judas distinguishes himself from the other disciples. Parallel episodes exist in the gospels of Thomas and Mark, where respectively Thomas and Peter demonstrate that he is the disciple who understands Jesus best. Competition to become the "best-loved" disciple was keen and betrayed the deep divisions within Jesus's inner circle. This is the most important point about Jesus's teachings: we know them through his followers; very few of his words survive. But that doesn't mean we should give up hope of drawing a reasonably accurate picture of the extraordinary man. We can use the differing viewpoints encoded in the surviving accounts of his life to triangulate, to sketch out a more authoritative portrait of Jesus. That is the good news of modern scholarship.As for the Gospel of Judas, it seems to leave little doubt that Judas betrayed Jesus and received some sort of payment in return. Why, after all, would Judas's followers claim that the disciple had betrayed Jesus if he hadn't? Saying that he *did* betray him, but for the *right* reason, is surely a second-best defense. You don't resort to it unless the main point, the betrayal, has been conceded. But then you could always say that this is what God intended, so how could the betrayal have been wrong? It's a difficult question to answer--and it reveals how closely Christianity and Gnosticism parallel each other on certain issues. Trying to understand Jesus's message, now as then, requires discipline, humility, and patience. Why bother? As Jesus may have said to his disciples:"Follow me, and I will teach you thingsNo ear of a prophet has heard,No eye of an angel has seen,No heart of mortal flesh has known." An exciting account of a discovery of profound historical and theological significance, this book examines a document hidden for 1700 years - a document whose existence was only known before now because of its condemnation in the 2nd century as a heretical text by Bishop Irenaeus of Lyon. Rediscovered along the Nile in 1970 as part of the Coptic book later called the Codex Tchacos, it was not until after the start of the 21st century that it finally reached the hands of experts who could translate and appreciate its significance.The actual content of the document now dubbed the Gospel of Judas is a small part of this book. There are unfortunate gaps in the text, but what can be followed was totally engrossing. Not only does it contradict many of New Testament interpretations I recall, but presents an almost antithetical version of Jesus's relationships with his apostles and, more importantly, the battle between good and evil. There were passages which actually caused a slight chill in me as certain science fiction tales involving alien intervention were brought to mind.A good portion of this book is an analysis of how this newfound material compares with other pre-orthodox Christian writings, both those included in the Bible and those not. From the very beginning I encountered historical and theological references that were beyond my knowledge, but I soon found that this was an opportunity for greatly expanding my understanding of early Christianity by doing quick collateral research on Wikipedia. An adequate understanding of "gnosticism" was a major key to appreciating this book. I was left wondering how much of what emerged as orthodox Christianity would not now be considered the building and protection of brand identity, and the treatment of Judas Iscariot a 2000-year effort at character assassination. 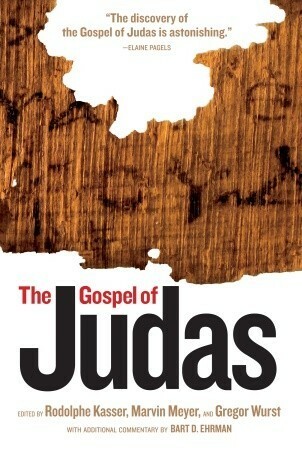 Book Review: The Gospel of Judas	The Gospel of Judas, believed to have been written by the Gnostic followers of Jesus, and translated by Rodolphe Kasser, Marvin Meyer, and Gregor Wurst, was one of the gospels written that didn't make it into the Bible. Instead of it's focus being mainly on Jesus' life, like the book of Mark, the Gospel of Judas focuses on Jesus' relationship with Judas Iscariot, one of his twelve disciples. The Gospel of Judas, instead of portraying Judas as one who betrays Jesus, instead shines him in a higher light, that Judas was following the instructions of Jesus, and that without his actions, Christianity wouldn't be what it is today. One thing I found interesting about this Gospel was how Jesus, very early in his relationship with the disciples, prophesied that Judas would eventually be replaced. Although the book does not cover it, Judas is replaced with Matthias. The only copy of the Gospel of Judas is in poor condition1, and translations are incomplete. As a result, reading the Gospel of Judas is incredibly frustrating, as there will be portions of a paragraph completely missing. For example, "Jesus said [to them], 'Stop sac[rificing…] which you have […] over the altar, since they are over your stars and your angels and have already come to their conclusion there. So let them be [ensnared] before you, and let them go [—about 15 lines missing—]generations […]. A baker cannot feed all creation  under [heaven]. And […] to them[…] and […] to us and […]." I would recommend the Gospel of Judas to anyone who is interested in looking at the actions of Judas from another point of view. However, it is difficult to comprehend many parts because of the missing parts, which was frustrating at points. I have to confess I started this book out of sheer interest in the subject matter, but I couldn't finish it -- I just thought it was too silly to believe. Maybe I've got too much of the traditional four gospels ingrained within me, but for Judas to be portrayed as the favorite and best disciple of Jesus who only did what he was told by Jesus to do and was therefore a hero as he brought about the crucifixion and resurrection strikes me as totally absurd. Not to mention that it was hard to read with all of the missing text that was skipped over and omitted. That was distracting. I couldn't buy the notion of Jesus appearing to his disciples in the form of a child. You'd think that would have been mentioned in another gospel. And here's one thing that might seem trite, but it bugs me nonetheless -- apparently this gospel was written in the second century. Well, who wrote it? If follows Judas for just a brief period of time up until his suicide, I believe. Well, if he killed himself, how did he communicate the secrets of this text to the ones who would ultimately write it? He was DEAD for Pete's sake! Isn't this just some second century made up gnostic tale by people wanting to stir things up? That's ultimately what it strikes me as. So, yeah, I probably should have finished it and maybe one day I'll return to it, but I just thought the premise(s) was too absurd to continue reading the book. Rodolphe Kasser Marvin W. Meyer Gregor Wurst François Gaudard Bart D. Ehrman - Born in Yverdon-les-Bains, Switzerland . Kasser obtained his higher education in theology in Lausanne and in Paris from 1946-1950. And a diploma from the École Pratique des Hautes Études (Ph.D. equivalent) in Paris in 1964. He conducted pastoral ministry in Switzerland and in France from 1953 to 1959.From 1963 to 1998 he was on the staff at the Faculty of Arts of the University of Geneva, lecturing in Coptic languages and literature. First as professor extraordinary from 1963 to 1976, then as professor from 1976 to 1998. Since 1965 he has been the head of the archaeological excavations of the Swiss Mission of Coptic Archaeology in the Kellia, Lower Egypt.Since 1963 Kasser has done important research in the field of Coptic philology, including the preparation of a new Coptic dictionary. This work was done in parallel with reforms in Coptic dialectal classification. Kasser's numerous publications, from 1964 to 2005, illustrate his activity of research. He has published several important Greek and Coptic codices of the Bodmeriana Library, most of them biblical.Since 2001 Kasser has organized the restoration and prepared the edition princeps of Codex Tchacos, containing the Gospel of Judas and three other Coptic gnostic texts.His recent published work is an English translation of a 1,700-year-old copy of the "Gospel of Judas". The papyrus manuscript went on display at the National Geographic Society's museum in Washington DC in April, 2006.The translation contends that the most vilified man in Christendom understood Jesus better than any of the other disciples. The disciple who betrayed Jesus was actually doing the bidding of Christ himself.